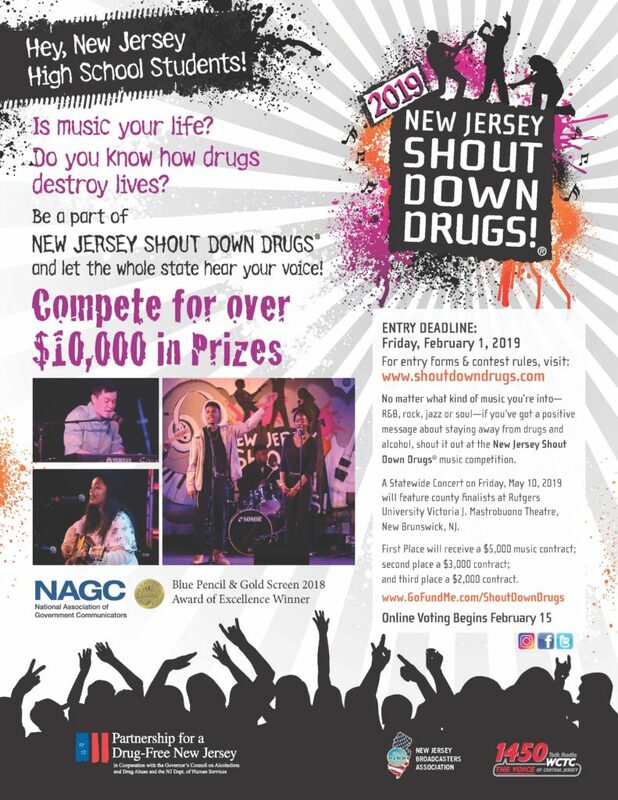 MILLBURN, NJ — High school students are invited to share substance use prevention messages through their original music as part of the 2019 New Jersey Shout Down Drugs contest. The Partnership for a Drug-Free New Jersey (PDFNJ) is accepting entries through Friday, February 1. Students interested in sharing their musical talent can submit original music with lyrics about substance use prevention. A panel of judges will select one finalist from every county, along with a few wild card contestants, to perform their original songs in the 15th annual Prevention Concert, which will be held at Rutgers University’s Victoria J. Mastrobuono Theatre in New Brunswick on Friday, May 10th. The winner of the New Jersey Shout Down Drugs competition, as decided by judges and announced at the end of the Prevention Concert, will receive a $5,000 music contract. The second- and third-place performers will receive $3,000 and $2,000 music contracts, respectively, with the Partnership for a Drug-Free New Jersey. Over a million online votes for the New Jersey Shout Down Drugs program have been cast and the numbers for contest favorites continue to grow. The top vote-getters will earn an automatic spot in the Prevention Concert. “No matter what genre of music – rock, jazz, hip-hop or R&B – students have a great opportunity to send a positive message about substance use prevention to their peers that could have an impact on their lives,” PDFNJ Executive Director Angelo Valente said. For rules and information on how to enter the New Jersey Shout Down Drugs music competition, contact Diane Higgins at 973-467-2100 Ext. 19 or diane@drugfreenj.org or visit www.shoutdowndrugs.com.